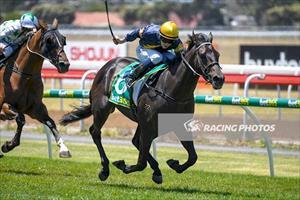 Yesterday at Geelong saw an impressive victory from Percivall Pott break through for his maiden victory in the Viatek Maiden Plate over 2400m in the hands of Patrick Moloney. Runner up at his last start, the Sir Percy gelding from Summer Heights started joint favourite on the tote with the second placed runner, and drew away by 1.3 lengths over the final stages boasting a strong maiden victory. He was purchased by Paul Moroney Bloodstock from the NZB Karaka Festival Sale 2014 on the account of JK Farm for $30,000 for a great group of owners. Percivall Pott is most certainly an honest galloper and has the makings of a quality stayer in the making.